The Lady Knights Volleyball defeated Maranatha to become Crossroads Conference Champions! 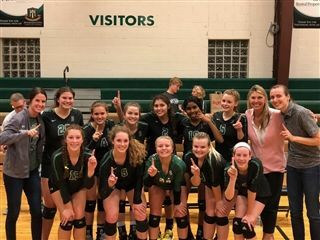 Knights Volleyball went undefeated in the Conference after defeating Maranatha Christian Acadmey. They were crowned Conference Champions. The Knights were seeded 2nd in Districts with a 16-4 record. The girls play in Districts on Tuesday, October 23 at St. Michael the Archangel at 6:15pm. Come out and support the ladies.